This is an Evans cigarette case. 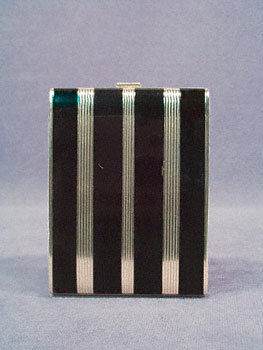 It has a striped pattern of black enamel and nickel on the front and a crosshatch pattern in the metal on the back. This case is 4-7/8" tall, 2-7/8" wide, and 3/4" thick. Inside there are two spring driven holders for non-filter cigarettes; each has "Evans U.S.A." embossed on it. The front has a few scuffs and scratches indicating very light usage, but this cigarette case is in very good condition, and is a great art deco smoking accessory.